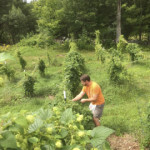 Many of my friends know that I’ve been exploring the idea of putting in a hop yard here at Third Stone Farm. I recently visited Rouleen Williams to check out her fantastic, green home, beautiful landscape & hop yard. 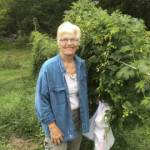 Rouleen generously shared her experience growing hops for fun, served lunch and even shared some beer! It was great to see her set up, designed for ease of use and effort. 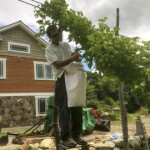 So many of the trellising plans that I’ve been reading about seem to be such major & complicated investments that it was great to see a simple system so elegant. Just yesterday, I walked the perimeter of my farm properties to check on some wild grapes and elderberry that I’ve been keeping an eye on. 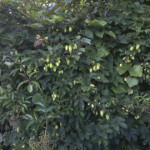 To my great surprise, I discovered some hop bines growing amongst the grapes! Should I take this as an auspicious sign? 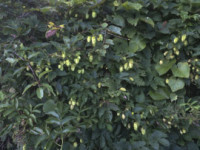 Just by chance, I came upon the hop flowers just at the moment of ripeness! 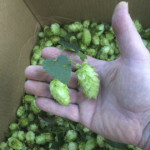 I picked enough to brew myself up a test batch of beer… I’ll let you know how it works out. Rich showing us how it’s done! Geez, I’m going to have to put a lock on the fridge.